Jeff Chase ran steers on the Brownlee-Cook ranch and joined our outfit on the north end. One day he drove down to the river country to ride through his steers, and while he was in the neighborhood, he paid us a visit. We sat out on the porch and talked. I told Jeff about an experience I'd had back in March. I hauled my mare up the flats north of Perryton to help some friends gather some heifers that had wintered on wheat pasture. It turned into one of those wrecks that happen fairly often in wheat pasture operations. Most often the cattle are yearlings—young and silly—and most often they are confined inside an electric fence, which is a thin strand of wire charged with electricity. The problem with an electric fence is that, once yearlings have learned to respect that thin wire, they don't want to get close to it. Even if you turn off the charger and take down a hundred yards of wire and posts, they think it's still there and you can't get them to cross the area that used to be fenced. This was the problem we ran into with the heifers. Time after time we eased them toward the spot where the fence was down, but instead of continuing east, they broke away from us and ran west. We had four well-mounted riders gathering sixty head, and we had a heck of a time getting those heifers out of the field. Jeff smiled. "I've got that problem solved." I couldn't wait to hear his solution, because I and a lot of good cowboys in the Panhandle sure didn't know about it. His solution was not more cowboys or faster horses. It was an old Longhorn steer that weighed 1600 pounds and had a span of horns so wide that he had to turn his head sideways to load into a stock trailer. Jeff acquired the steer when it was a scrawny yearling. He kept it around his place and let his boys use it as a roping steer. "On cold afternoons, they'd go to the inside arena and practice heading and heeling on that steer. When they got tired of that, they put a flank rope on him and bucked him out. He got so gentle that Tanner started riding him around with a saddle." The next winter, Jeff turned the steer out on wheat pasture with a bunch of yearlings, and he began to notice that the younger cattle would follow the steer around and imitate everything he did. "When the steer went to water, the yearlings followed. When he laid down, they laid down. When he got up, they got up." And that's when Jeff started putting the steer to work. Three days before he wanted to gather a bunch, he would haul the steer to the field and turn him out with the yearlings. On shipping day, he would put a rope around the steer's horns and lead him out. The yearlings followed every time, without the usual wrecks and stampedes. Last winter, a friend called him in desperation. 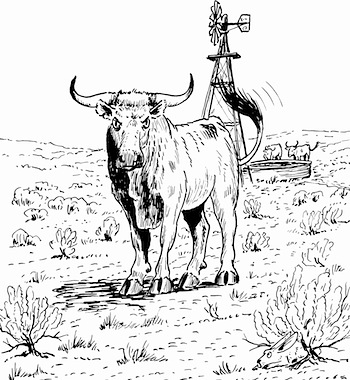 He had a bunch of steers on wheat that absolutely could not be gathered. Day after day his crew had tried and failed to pen them in a portable corral. The man didn't know what he was going to do. Jeff hauled his steer to the field, turned him out, left him there three days, and penned the cattle by himself. What a brilliant solution! And it was so simple that I never would have thought of it. I should have. Every cowboy in this country knows the story about Charles Goodnight's lead steer, Old Blue, who led Goodnight's herds of cattle hundreds of miles to market in the 1870s. Sometimes we get so wrapped up in our problems, we forget that those old timers had a lot of things figured out a hundred years ago. All we have to do is look back and pay attention. Hope you enjoyed the latest from John R. Erickson, be sure to let us here what you think below!